HomeAnalysisVaccine Induced Brain Damage … Fact Not Fiction! Vaccine Induced Brain Damage … Fact Not Fiction! …Have you ever wondered how it must feel bearing the mental weight (conscience) for the loss of life and personal suffering on a massive scale, yet continuing and even advancing these mechanisms daily? …Have you ever stopped to contemplate just “how much money” is the trigger to sell out your fellow citizens and humanity into this realm of suffering and death … and still sleep at night? …People who meet this criteria are psychotic … as in not normal, because the promise of stature, enrichment or power are the triggers that seem to readily silence their conscience forever. …The very sad part of this true story is … these are the very people responsible for safeguarding the health of you and your precious children! 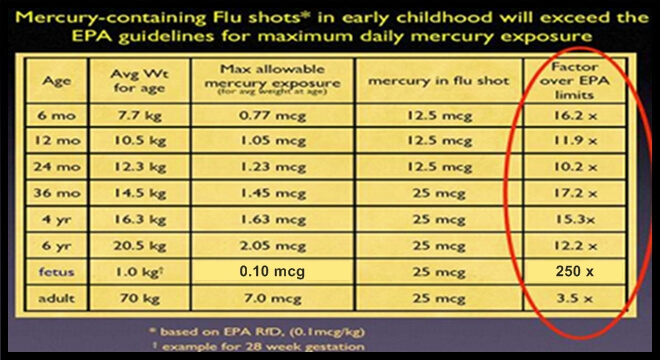 Before you step up to say (as I hear entirely too often) that the ’25mcg’ of mercury in the yearly flu shot (and others) is not a lot of anything … please observe the EPA’s limits in the table below. “A lot” is a relative term, and for the pregnant woman, or her developing fetus … in this case it is ‘A Hell of a LOT’, and the reasons for this are well explained in the short article attached below. Thimerosal (mercury) is contained in several vaccines, the most common being the yearly flu shot. The dosage for adults is about 25mcg. 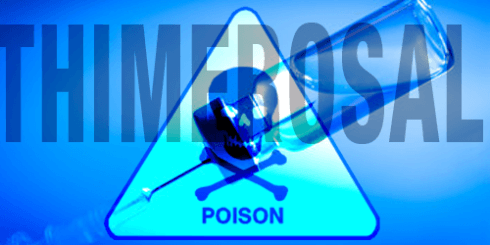 Thimerosal is broken down by the body in the following fashion, the ethylmercury is first metabolized by the body into even more toxic methylmercury, which is then re-metabolized into the ultimate toxin, inorganic mercury …YES I said Inorganic Mercury … The most deadly and toxic naturally occurring substance known to exist on this planet to the human physiology and second only to Ionizing Radiation. What does mercury do to the brain? *This product should be considered equivalent to thimerosal ‐ free products. This vaccine may contain trace amounts (<0.3mcg) of mercury left after post production thimerosal removal; these amounts have no biological effect. 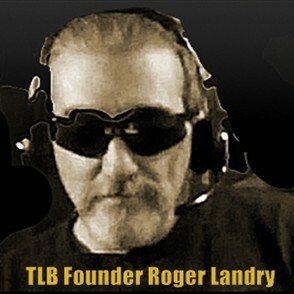 ANY Level of Mercury is Dangerous to Human Physiology … NO Exception! Yes you read it right … the fetus with no discernible blood brain barrier to protect it, and a just developing brain, receives (via it’s mothers blood) 250 times the maximum exposure allowed by the EPA of the most toxic naturally occurring substance on this planet! How is this ever reconcilable between the standards set by the EPA, and the vaccines promoted by the CDC? Don’t these two agencies communicate, report to the same government, and work for … us ?? !! But coming from an agency known to destroy or hide research proving the absolute danger of vaccines in order to protect their masters (Big Pharma), and to the extreme detriment of you and your vulnerable children … this is merely business as usual. Thus the opening comments of this article. 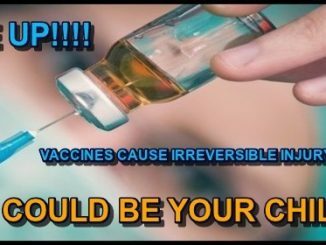 I will be the first to tell you that Vaccines are not the only source for mercury in the body, but when it is injected, via vaccination directly into the body, bypassing any and all of the bodies protective systems … it must be considered the most damaging mechanism of any existing. So whether the mercury is injected into the infant or young child’s body, or the pregnant mothers body, the results are dangerous at best … and catastrophic at worst, with massive emphasis on the developing brain! For a look at another impact Mercury delivered in Vaccines has on the brain in the form of Thimerosal, please, continue reading the attached short (but explosive) article. Neurotransmitters are chemicals released across the synapse to facilitate signal transduction from the pre-synaptic neuron to the postsynaptic target cell. “Glutamate is the most abundant neurotransmitter used in the brain, by far. It far exceeds all the other neurotransmitters in the brain put together. It makes up 90% of the neurotransmission in the cortex and 50% of the total brain’s neurotransmission. In addition, it also controls the other neurotransmitters. It controls serotonin, dopamine, and norepinephrine… they’re all regulated by glutamate neurotransmission. [Glutamate neurotransmitters] also, interestingly, play a major role in the development of the brain. So in neural development from inside the uterus until that first three or four years of life, glutamate is playing a major major role, and that’s what’s important to understand. Now, what we’re talking about is the neural transmission that is going across the synapse, how brain cells communicate with one another. … To much glutamate produces destruction of the entire synapse and its connections. That’s what excitotoxicity is… there’s too much glutamate. Now, even though glutamate is the most abundant neurotransmitter in the brain, it is the most toxic. It is highly toxic. And the brain has a very elaborate system to control that. … The glutamate transporters play a major role in how the brain is formed. During brain formation, in utero and after birth… those first two years that are so critical, the level of these glutamate transport proteins starts to rise. The reason they rise is to protect the brain against too much glutamate. Anything that interferes with that puts the brain at risk during its development. HEADS UP!!!! VACCINES CAN AND DO CAUSE INJURY!!! !